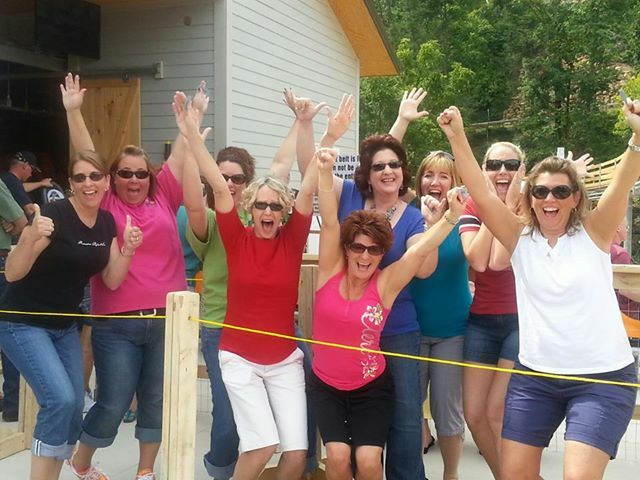 More than 30 women headed to Pigeon Forge Tennessee last weekend- retreat bound. It was my first retreat with my new family, my Villa Heights Sisters. I might have been a little nervous- you know, spending several days in an unfamiliar setting with sisters, some yet unmet. I might have been afraid that I wouldn't fit in. We might have drawn chalk bodies at the Cracker Barrel and asked policemen to sit in the back of their car- all for a few more points. 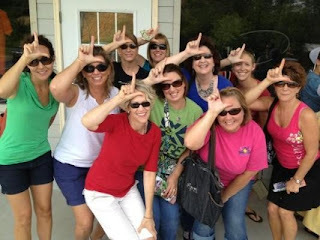 We might have seen our competitive sides push through in hopes of winning the Scavenger Hunt. We might have started shopping as soon as we arrived in town. We might have stayed in the biggest cabin I've ever seen. We might have enjoyed the best apple fritters I've ever eaten and filled our bellies with goodness like chicken pot pies and country fried steak at the Apple Barn. We might have played a speed friendship game where the noise level broke the sound barrier. We might have followed it with card games and movies and such craziness until the wee hours of the morning. We might have had Saturday breakfast in our jammies. We might have been test riders for the brand new Smokey Mountain Alpine Coaster. We might have liked it so much, we rode it twice. We might have floated down the river in tubes. We might have napped by the sound of the slow rushing water, read books under the shade trees, swatted gnats and we might have rocked and laughed while we witnessed our sister tumble out of her chair right.in.to.the.river. We might have eaten the best catered BBQ, Baked Beans, Cole Slaw and other fixings in the massive dining room that seated us all. We might have gathered together on a Saturday night piled together in a living room where we read the Word, prayed, encouraged each other, offered thanksgiving songs and worshipped God while we sipped coffee and soda and lifted each other up. We might have celebrated our Pastor's wife's 48th birthday, again. And we might have sent our Pastor a message that he is loved. You might have had to be there to understand. It's all about loving each other - not losers. We might have talked most of the nights away- realizing that our sisters yet unmet hours before are much like ourselves and we might have bonded through our trials and triumphs already shared. We might have spent the rest of our time doing all manner of things like watching movies, taking a run (not me of course) crocheting and shopping, shopping, shopping. 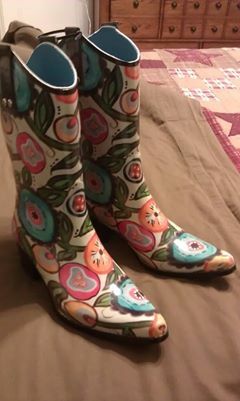 We might have bought fun rain boots- never before considered but too fun to pass up. We might have enjoyed our time so much that we were torn between hiding out by the river just one more day and hurrying home to the husbands who kept life moving while we were away. We might have come home to piles of laundry and grumpy kids and busy schedules. We might have been so excited once we fixed our eyes on our families that we were no longer torn but ecstatic to be right.where.God.designed.us.to.be. And if you ask us, we will tell. We will tell you what an awesome time we had and what a mighty God we serve. God who revealed Himself to us in the river and the trees and quiet and the loud and the silly games and the serious burdens and the funny story's and the prayers and songs given in thanks. Revealed in the quick chats and conversations lasting hours ---a gift we'll cherish. I might have been nervous, I might have been afraid... but no more. I quickly discovered I was among family- 33 new sisters to be exact. I'll take Grade 2 and Grade 3 for a year, please! Trading in the Work Boots. Who gets us in the divorce?